We are in the process of changes, and need your assistance. OBradio is an internet radio station that was started 8 months ago by members of Occupy Boston in an effort to broadcast the voice of the 99 percent, broadcasting the injustices of the world, and sharing collective information on the struggles and success’ of the movement. 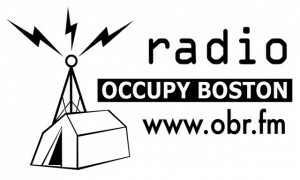 In the past 8 months OBradio has gone from simply broadcasting on the spot interviews with occupiers from Dewey Square and General Assemblies, to producing 12 original show’s on a weekly basis. The facility in which we broadcast from is called E5, or rather Encuentro Cinco. E5 houses 20+ organizations that are all oriented toward the advancement of liberties of all people. E5 was instrumental in providing a space for meetings, organization, educational conferences, and media development for Occupy Boston from the very beginning. OBRadio moved into E5 in February building out a studio from which we broadcast from today. E5 recently was informed that it’s space at 33 harrison, in Chinatown, would no longer be available for it to rent, and as a result OBradio, and the rest of the organizations at E5 must move at the end of July 2012. E5 is in the process of acquiring another space that will accommodate the organizations that utilize the space at 33 Harrison. OBRadio is looking to raise a minimum of $1500 and a reach level of $3000 for this move, these funds will go towards our future rent (which e5 sorely needs for the transition) and the build-out for our next studio. We are asking for what you can spare, skip the coffee one day in our name, drive the long way around and give us the toll money, shop at the thrift store and give us the cash for that new shirt, do the pbr & ps3 on the couch and tip us instead. What can you spare? Even $5 adds up! DONATE! We ask, we cajole & we promise to keep kicking out FREE RADIO! DONATE! We are seeking 30 sustaining donors of $10 or more a month, in order to pay monthly expenses, broadcasting, internet, phone and services. Even the modest amount of $10 would help us in our operating costs and allow us to focus on our programming and outreach. DONATE! Want to help with fundraising but can’t spare the cash? We so understand that! Ways you can help us raise money! Host a house party! BBQ it up and pass the hat, every buck counts. And well it’s a party! Stick a donation jar at your desk at work. Discreet and okay with your boss. You’d be surprised. Help us make and sell some T-shirts. Everyone loves T-shirts! Thanks for your time and support, we are nothing without you! Check out our blog and stay tuned @ www.obr.fm! Join Host Kendra as she talks Security Culture and CISPA.